All the answer to your questions are (probably) here. We're an activity centre and beautiful meeting spot in rural Lincolnshire with one of the best ropes courses and we've been around for a long time. The ropes course is a high wire forest adventure, like an obstacle course up high in the trees. We harness you up, and then you take a trip high in the trees. We've got zip lines, and over 55 individual elements. Its a complete experience. Basics are £20 for the original Wild Ropes Course and £30 for the Challenge Course & Big Zip (includes Wild Ropes Course). It is £10 for Archery but we have lots and lots of other things available. Click here for a full price breakdown. The minimum age is 6. However we recommend children from 8 years of age as the course is very challenging for younger children. The Big Zip Challenge Course we recommend for 10 and older. Young children who are under 140cm will have to be accompanied by someone taller than 140cm (any age though) to help them with their safety hook around the course. We suggest you wear something you don't mind getting a bit dirty. Dress for the weather so bring something waterproof if its raining. Please wear appropiate footwear with soles with good grips. Long hair should be tied back too. There is a higher risk of getting a scrape or bump while wearing shorts too. 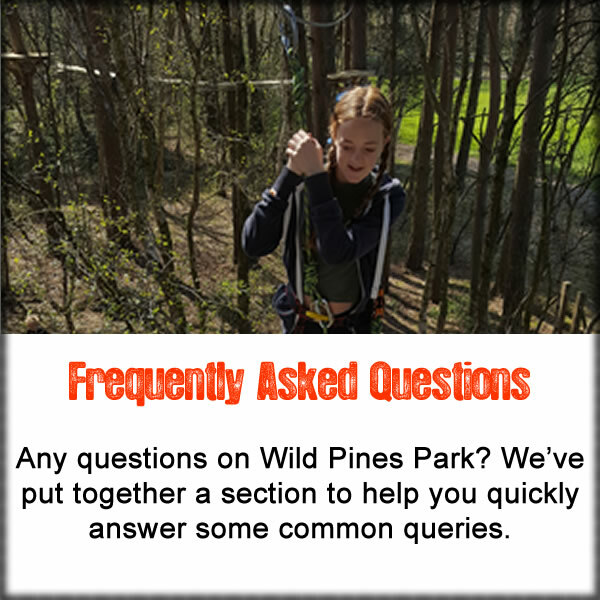 Wild Pines Park has an exceptional safety records and exceeds all of the European safety standards. Can anyone take part, is there a weight limit? There is a weight limit of 17 stone (108kg). However, anyone from the age of 6 can use the course. Our harnesses have a maximum hip/waist size of 49" - 125cm. No, you can turn up on the day but booking is highly recommended. How does the Big Zip and Challenge Course Work? This is an extension of the first course. Everyone must complete the first course before going on it. Because it is higher, harder and the jumps quite far the minimum age is 10 and a minimum height of 150cm. No exceptions I'm afraid. With both courses combined it is over 640m long and will be one of the most challenging and longest ropes courses in the country. Do people watching have to pay? No, not at all. Just come and enjoy our amazing woodland, watch from below and perhaps take the beautiful woodland walk while you are here. How do I pay using my gift vouchers? Just click on our booking page, select a time and date, put all your details in and when you get to the payment page select gift vouchers instead of the standard payment method. Don’t put the code into the promo code box otherwise it will say ‘invalid’! Ideal group sizes are between 1 and 12 people for the ropes course and between 4 and 15 for archery. We can cater for all group sizes but please contact us for specific details. If there are less than 8 people we may join you with another small group. However, if you don't want to be part of another group please let us know. We are happy to discuss your requirements by phone, email or on a site visit. We'll advise you when you book, but about 10 minutes before the booking time, just enough time to see the site, get to the loo and get ready for harnessing! Are there any restrictions on taking photos? Usually no, however from time to time when we have multiple groups on site there maybe occasions when photography is not permitted. We will let you know on the day when you arrive if this is the case. Not to worry, it does happen from time to time and you can be rescued and brought down safely at any point on the course. We do encourage everyone to finish it as often when people are brought down they want to get straight back up again! Yes of course you can, spectators are more than welcome. Yes, we have picnic benches too, after you've finished a course you can sit back and relax in the wood with your picnic. Can I just do the free activities? Unfortunately not, we have lots of free activities on site and plan to have more in the future. However these activities are for people who have already paid for the ropes course and archery. You just dangle in the harness, thats what they're there for! Then you can either get yourself back up or we can help you, its quite easy! It doesn't stop. Its entirely up to you, if you see its going to be wet and decide you don't want to do it, as long as you give us some notice, we can reschedule. The only times we stop running courses is during very high winds and thunderstorms. We need 48 hours notice for a full refund. Bookings of more than 12 people requires 7 days notice. However having said that, just get in contact with one of the team and we will see if we can work something out, no promises though! Can I bring my dog if I am watching from the ground? Yes, but all dogs must be kept on their leads at all times and any mess cleared up after them. We very much welcome responsible dog owners. You don't have to be super fit to complete the course but if you break into a sweat walking up stairs, then you'll break into a sweat at the ropes course. Its reasonably energetic, your not on a travellator but then thats why you're here! If I need to rearrange or cancel a booking how can I contact you? Please give us as much notice as possible by emailing or calling us on our office number 01673 842724 and leave a message. If theres any questions you think should be here, then please do email us.